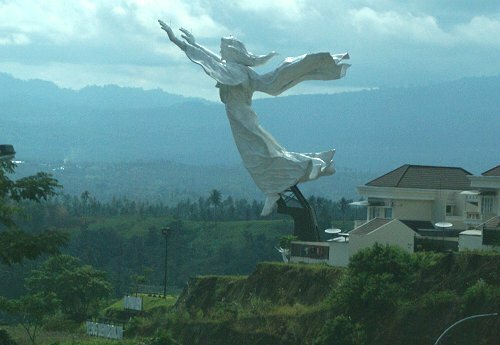 Welcome to Manado, the capital city of North Sulawesi province in Indonesia and the sister city of General Santos city in the Philippines. A city of about 500,000 inhabitants (as of 2007) and also known as the city of churches. It is a city where you can see churches almost every 100 meters, particularly in it’s hinterland! 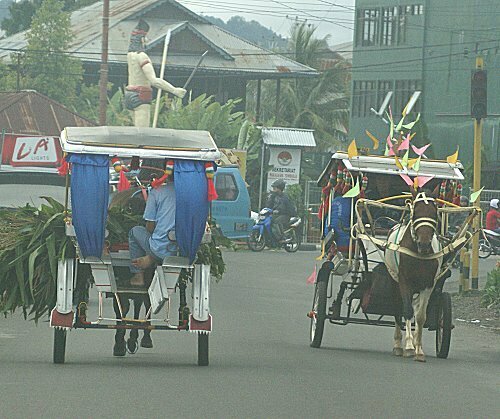 North Sulawesi has a few regencies, Manado City (a 157-sq.km town), Tomohon City, Bitung City (the sister city of Davao City in the Philippines), North Minahasa, Central Minahasa (the sister providence of Rhode Island USA), South Minahasa, and so on. It has a total population of more than 2.2 million. Local people in North Sulawesi are called Minahasans and they speak Minahasan dialect. There are minor differences between the dialect that is spoken in the North, the one spoken in the Central region and the one that is spoken in the Southern region. Minahasa literally means "unity" or "becoming one united." The people started to call themselves Minahasans after a war among kingdoms in North Sulawesi ended many centuries ago. The Minahasans believe they are descendants of Toar and Lumimuut, a mythical couple who were actually mother and son. Lumimuut was the mother and Toar the son. Lumimuut descended from the gods and was eternally young and beautiful. Their descendants were then basically broken up into three groups. One was the priests’group. Another one was for officials and the third one was for ordinary citizens. It is believed that in around mid 600's AD these groups of people sat down and discussed amongst themselves territories and law enactment in an area called Pinawetengan (click here for more information about Watu Pinawetengan) and they drew lines and other symbolic drawings on a big stone, which still can be seen today. European explorers (particularly Portuguese and Spanish ones) started spreading their influences to Minahasan culture in the early 1500's and brought Christianity to Minahasa for the first time in the mid 1540's. They were lead by a Spanish priest Fr. Francis Xavier, who passed away in China a few years later. One hundred years after Fr. Francis Xavier left Minahasa, Dutch missionaries came and intensively taught Christianity to local people and by the late 1880's almost all Minahasans had been baptized. The Dutch East Indies government had controlled Manado port since the 1670's. This European influences can also be seen in an ancient tomb of Waruga (click here for more about the ancient tomb of Waruga). Today Minahasans still love having parties, gatherings and Thanksgiving. This is said to be influenced by the Spanish and Portuguese. Their thanksgiving day is usually held once a year between July and August on every Sunday and rotated from one district to another. This is the moment when people like you can enjoy free meals! In the past this Northeastern part of Sulawesi peninsula was famous for its spices. 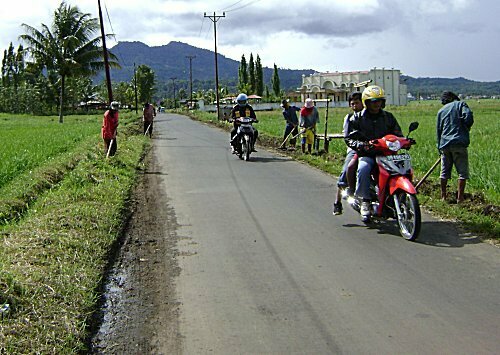 A village called Sonder in Central Minahasa was then famous for its cloves. It was one of the richest villages in Asia during the 1970’s until early 1980’s before somebody that was powerfull took the golden era away. According to local stories, farmers were forced to sell their cloves to a particular company at prices lower than the market standards, where then that company sold the cloves to tobacco third parties with huge profits margin. Today the village looks similar as other villages in north Sulawesi. Going down from mountaineous areas towards the bay of Manado, there is a well known underwater garden, Bunaken. This is one the world's best marine park (click here for more about Bunaken). Just like many other Indonesians, people know Manado or Minahasa land only for Bunaken or Lembeh Strait. Here in this website, you will find that there is actually more to see. 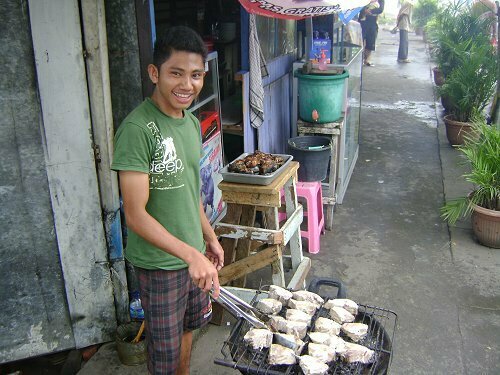 Minahasan food is also somehow different to the in rest of Western Indonesia. Minahasans eat almost every moving living creature and like to have their meals hot and spicy. There is a famous joke among themselves, "everything has legs can be eaten, except table legs and humans!" 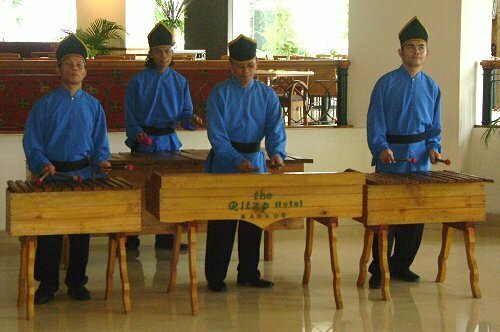 More about Minahasan or Manado Food, Drinks and Entertainments here. Watch a short clip on Manado from Indonesia.Travel. Apart from eating unusual dishes, they also have a unique way of finding directions. If you want to go to a small particular hotel or souvenir shop in Manado city, locals most likely won't have a clue if you just tell them the address (unless they are frequent city explorers!). You need to mention any big landmarks or buildings or districts near your destination to get right directions. For instance, "a small hotel of ABC near the Cathedral" or "near the Police HQ", "a small hospital of ABC in Malalayang district" or, "near a statue of Sam Ratulangi". Manado/Minahasa, home to Tarsius, the smallest monkey on earth, is a place where you can get a tan on beaches and cool down in highlands, a place where you can see underwater life and life inside active volcanos, a place where you can see a stronghold of Christianity in a predominantly Muslim country, just to name a few features.